Grow old and go bold. The older I get the more I realize I know so very little. So unlike when I was 17 and knew it all! Another birthday is soon on the way and having spent almost a full year past the big “five oh” mark I’m ready to give up all my vintage and thrifted clothing and turn to mainstream fast fashion to fulfill all my consumer needs so I can finally fit in with everyone else. I’m going to start doing loads of sponsorships on my blog with companies I used to despise. I’m finally going to make some money as a mainstream blogger! I wanted to see if you were paying attention! Not this year at least. I’m old enough to know you should “never say never”. Heck it wasn’t too long ago that I thought buying thrifted or secondhand items was akin to buying someone else’s garbage and I had no clue about vintage clothing or why anyone would want to wear it for that matter. Now I’m a vintage hoarder reseller and a thrifting pro fighter. Proof is in this recent video I made with Melanie and Sue when I was in Vancouver. Yeah I take Melanie down. No one gets between me and some choice vintage! 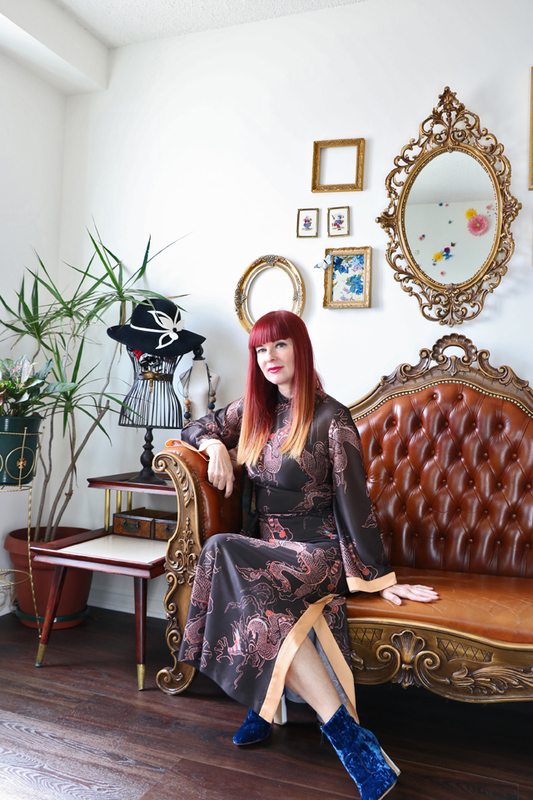 Being a vintage lover and a thrifter have ensured that the older I get the bolder I get. 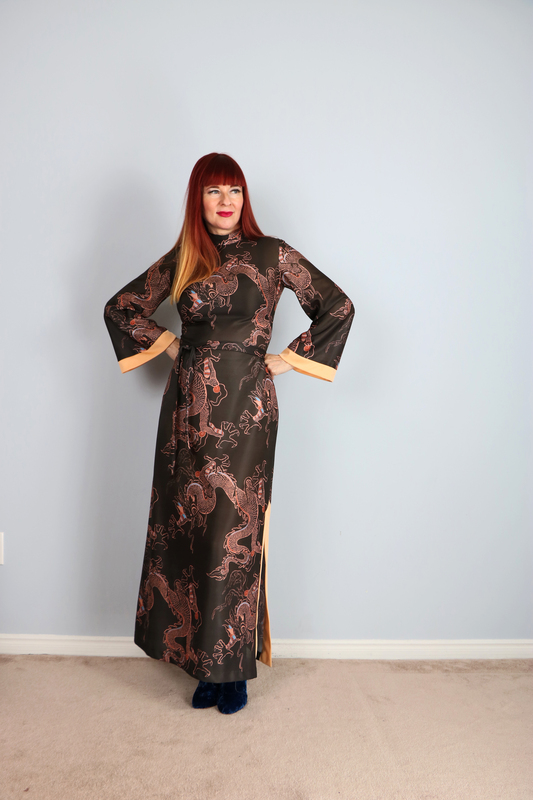 Vintage dragon bell sleeve maxi dress? I’ve made it this far baby…bring it! 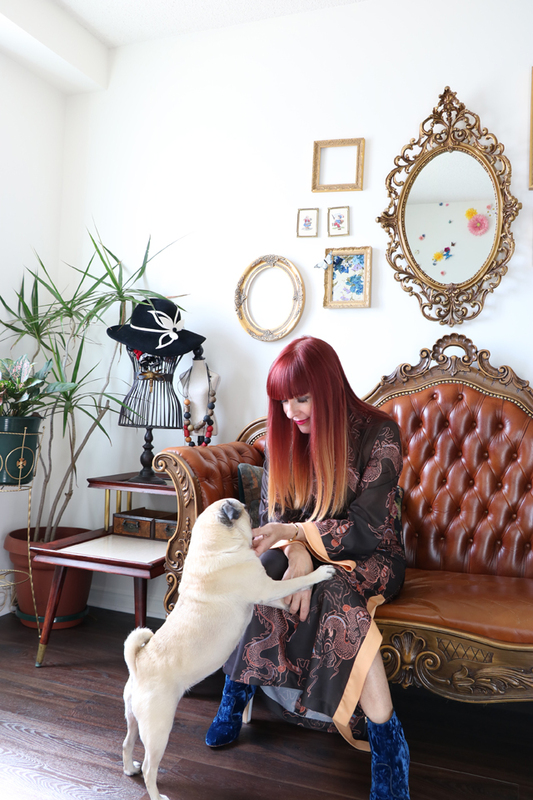 My style is influenced by what I find when thrifting or shopping vintage. Not by other bloggers, magazines or TV. When you don’t play the same game as everyone else you can make up your own rules. I was hoping to take this maxi dress on my trip to Hong Kong but my husband told me the temperatures are hovering around 30 C, more with the humidity. I have a feeling shorter silk dresses and sandals might be the best choice. Do you feel as you grow older your style is getting bolder? If so, why? Well I feel like you wrote this post just for me, Suzanne! Of course, it may not just be the age that has made me bolder—it may be the fact that I’m blogging and reading a ton of blogs. Because I think seeing other women’s perspectives on style & clothing can be so enlightening!! I was just talking to a friend the other day, how when we were younger, all we wanted to do was look like the other girls! Now that I’m older, I want to stand out more!! You had me worried there for about 5 seconds! Give up vintage? Fast fashion? Following the crowd? F*ck that. You’re one of my tribe and that’s why I love you! Send that Chinese dress and blue boots my way when you’ve finished with them…please! You didn’t fool me for a minute! But you made me laugh. I love your sense of humor. 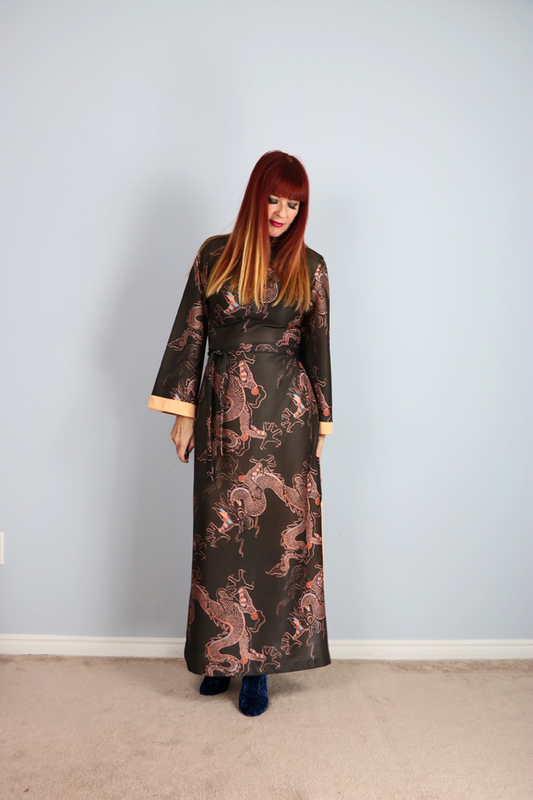 You look absolutely stunning in this long dragon kimono dress Suzanne. The colors in it are really unusual and so beautiful and they are so complimentary to your hair and complexion. I was honestly a bit taken aback by the elegance and beauty of this piece and how great it looks on you! Oh my gosh I love this on you! 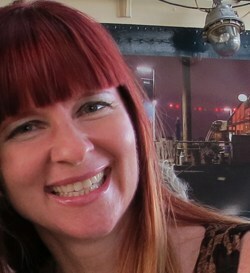 I have coveted that dress since you first posted photos about the cool vintage show you attended. But honestly, no matter how old I get, I could never pull this look off as well as you do. 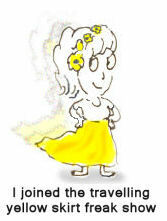 It suits you to a tee–dragons and all! ? Truth is, I can’t imagine you ever NOT being bold and creative. It’s one of the many reasons I adore you. Yes, with age comes wisdom: to not give a (insert your choice of curse word here) about what people think about your style. Loving the kimono dress. I adore kimonos and this is a particularly lovely one. Those soft yellow trims at the sides and sleeves!! As for older-bolder.. oh yes. I even wore little socks in my peeptoe shoes. If you had predicted this two years ago I would have said NEVER. You are right: never say never. Hooray Greetje!! I saw that you tried the little socks with peep toe pumps. Bold move! I’ll bet it looked great! ! This dress makes you look so tall! Love this look, love your writing. The style and colours in this dress are so flattering on you. I knew you would never renounce secondhand shopping for fast fashion. I’ve always dressed differently from most of the people around me, and I suppose you could say I’ve become bolder in my style as I’ve aged because I’m past the point of caring what other people think of my style choices. I wear what feels most like me that particular day. Love this delicate, ASIAN FLORAL maxi, It looks so fabulous and Old Hollywood! I love video-making and I’m so happy that you and Sue are into it with me. It took me a while to rev into gear this time but once I did, I was possessed, as usual. With each project I do I learn so much. It also took a while to figure out how to put it all together with coherence. We were always laughing in the scenes – hahaha, what a surprise. And yeah, you took me down, of course!, but I got the shoes in the end. Heh. I can’t see you ever giving up thrifting and you always look impeccable in your choices, like this amazing maxi dress. You’re a true queen of the thrift. Mainstream blogger? Puh. Although there’s no reason the thrift angle shouldn’t become mainstream. And did you really think we believed that for a minute? Come on! Hahaha, enjoy your Easter! oh yes, the older, the bolder! !, I didn’t believe anything contrary from you, nor for a second!!. Love your dress, such a magnificent luxurious piece, and you look gorgeous!! 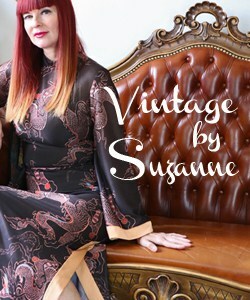 How right you are Suzanne – with age does come confidence. I care less and less what I “ought” to be wearing and trust my instincts more and more. Yes, I did have a moment of panic that you were maybe about to jump ship in some middle life crisis. Which would really be fine, honey, if you weren’t one of the finest vintage stylists I know. Totally selfish of me I know, but hey you have to look after number one! But never say never, indeed, that’s everyone’s prerogative.